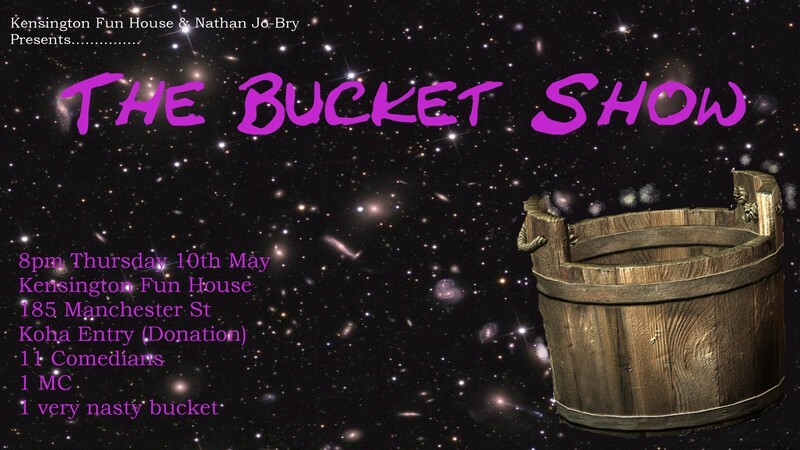 The Bucket Show is back! Once a month the Kensington Fun House holds a unique comedy show that tests local comedians and puts the pressure on in a very entertaining way. Local comedians draw a card from the "Bucket" and have to do what ever the card says... and make it funny. All comedians get 6 minutes of stage time...so plenty of time to make you laugh, make you cry or make you just sit there scratching your head and thinking WTF? Either way it will be bloody entertaining. Your MC for this event is... Cam Mcleod. Show is Koha... so a donation on arrival at the bar would be lovely. Koha bucket will also be passed around throughout the show for you to truly show how much you enjoyed the comedians. All donations go 100% to the performers. So round up some friends or family and come down for an evening of entertainment. Come to the Kensington Fun House where the staff will look after your beverage needs, smile nicely and give you free lollipops.